While doing research about suitable reefers for the layout era - 1952 - I came upon several refrigerator cars decorated in dubious paint scheme. Most of them were made by manufacturers know for they "creativity". However, a model among many caught my attention. It was the Accurail #4813 kit, which was re-released with an improved paint scheme (mainly the Erie Diamond logo) as kit #4813-1. While Accurail is now for their nice quality kits, we all know they apply the paint scheme on their models if it is fairly similar to a real prototype. This isn't criticism toward Accurail because most major manufacturers do that to make their models more appealing to a large crowd. In fact, Accurail generally try to find prototypes that are close enough to not be foobies and generally, their paint schemes are accurate and based on real-life examples. This is interesting since from that, I can guess the URTX-Erie paint scheme isn't a fabrication, but probably a real thing. However, finding the real prototype cars specification is quite hard. As far as I can tell, the Accurail car represent a reefer built circa 1936. The big question is did Erie still leased reefers in the early 1950s. If yes, were the cars repainted during that period of time. My guess is yes. I have many reason to believe an updated paint scheme wouldn't have mentionned "Ventilated Refrigerator" as this expression was no longer used by railroads by the 50s. Also, the way the dimension data is spelled is quite archaic. 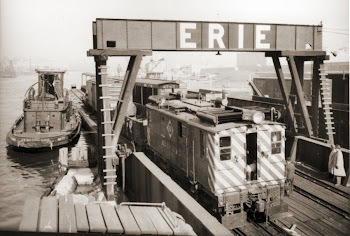 Did Erie leased or owned reefers in the early 1950s? If yes, what type of reefer was it (wood, steel, etc.)? Which prototype? What was the paint scheme or did Accurail's paint scheme survived until then? Any reference to specific ORER information would be valuable.